"No one ever believed it would happen at Columbine High School in Littleton, Colorado. But hopefully people across the nation, across the state, will realize that it can happen in their school." Those were the chilling words then-Columbine High School principal Frank DeAngelis told ABC News just days after the April 20, 1999, massacre, when two students opened fire at the school, killing 12 of their fellow students and a teacher before killing themselves. (Steve Starr/Getty Images) Students run out of the Columbine High School in Littleton, Colo. as two gunmen went on a shooting spree killing fifteen, including themselves, April 20, 1999. April 20, 1999, was a "beautiful spring day," 70 degrees with blue skies, DeAngelis said. He said he was in his office when "my secretary comes running in and says there's a report of gunfire." DeAngelis said his first reaction was a senior prank -- an actual shooting "can't be happening at Columbine." "As I ran out of my office, my worst nightmare became a reality," DeAngelis said. "I saw a gunman coming toward me. I visibly remember what he was wearing, with the baseball cap turned backward and white T-shirt, black vest. I remember the gun -- a long gun." At that moment a group of at least 20 girls were coming out of a locker room to head to gym class. "They were right in the middle of the crossfire so I ran down to them. We went down a side hallway to get away from the gunman," he said. "As I approached the gymnasium -- the door was locked. So the girls were in a state of panic. ... The sound of the shots were getting closer." 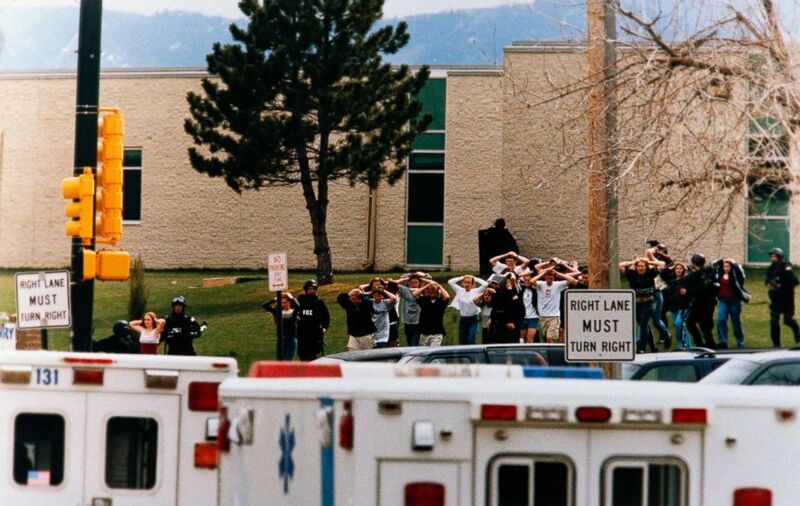 (Mark Leffingwell/AFP/Getty Images) Students from Columbine High School in Littleton, Colo., watch as the last of their fellow students are evacuated from the school building April 20, 1999 following a shooting spree at the school. DeAngelis said he reached into his pocket and pulled out his key ring with 35 keys -- miraculously, for the first time, he happened to pick the right key that opened the door on the first try. He went outside and saw officers arriving, so he came back in to help usher that group of girls to safety. DeAngelis said he wanted to go back into the building to help others, but "at that time they really secured the building -- they wouldn't allow anyone to go in until SWAT got there. Which was really frustrating, I think, for the first responding officers, because the protocol was to secure the perimeter." That night, it fell to DeAngelis and a grief counselor to tell waiting parents that "there's a good chance their kids lost their lives in school that day. Which was one of the most devastating things I've ever had to do." 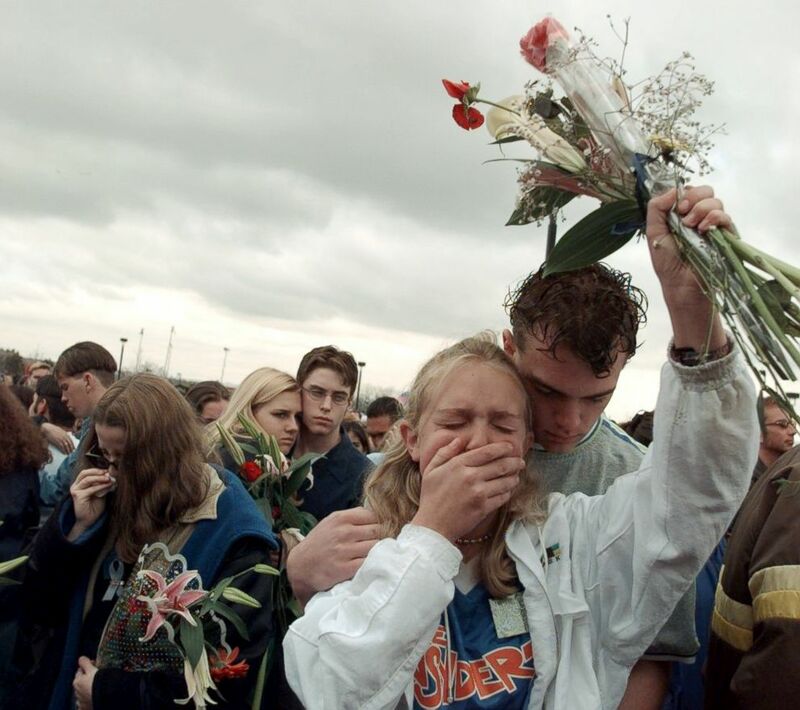 (RameyPix/Getty Images) The scene at Columbine High School in Colorado, April 24, 1999, in the days following the massacre on April 20. 1999. That night, as DeAngelis tried to think of what he was going to say to the community the next day, "I was really questioning my faith a little bit, saying, how could this possibly happen?" Days later, a local church leader told him he survived for a reason and that he should focus on rebuilding the community, which he said "was so important putting things into perspective for me spiritually." (David Handschuh/NY Daily News Archive via Getty Images) Mourners gather for memorial to victims at Columbine High School on April 25, 1999 in Littleton, Colo., where two teenagers shot to death 12 students and a teacher before killing themselves. 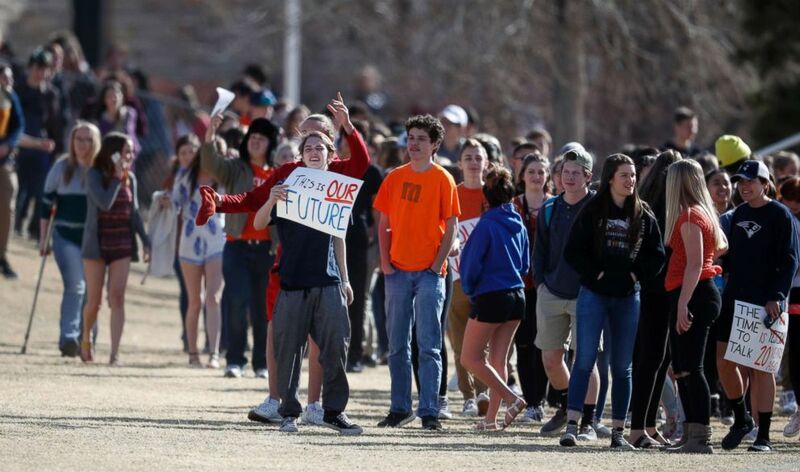 "But I kept thinking I didn't build that community back up where it needed to be," DeAngelis said, so then he decided to "stay until every kid who was in elementary school in the Columbine area [at the time of the shooting] ... graduated from high school. And that took me through 2012." He said he was getting ready to retire when a parent asked him to stay, telling him her child was in pre-school at the time of the shooting. 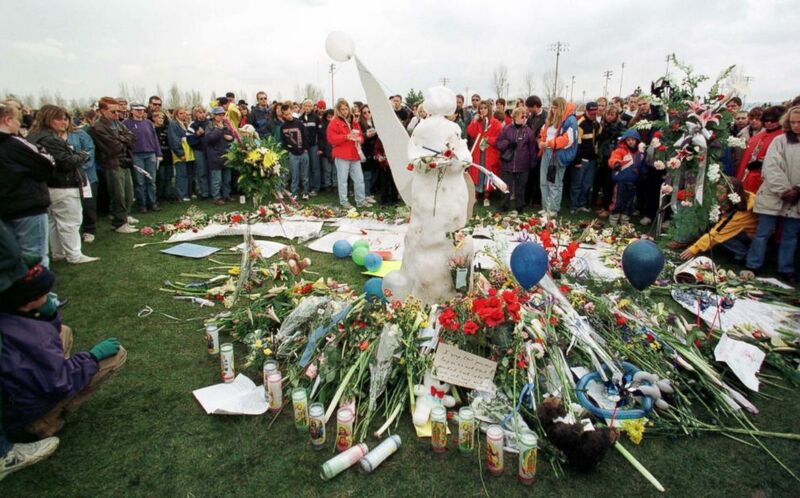 (Mark Leffingwell/AFP/Getty Images) A large crowd circles an angel made of snow leaving flowers during a memorial service, April 25, 1999 in remembrance of the students who were killed in the shooting at Columbine High School in Littleton, Colo. on April 20, 1999. "I stayed until 2014 which would have been 15 years after the tragedy," he said. "So all the kids that were in elementary school had graduated, and we had kids that were now coming to Columbine that weren't even born yet when the tragedy happened." But, DeAngelis added, in those years "I needed Columbine probably more than it needed me." 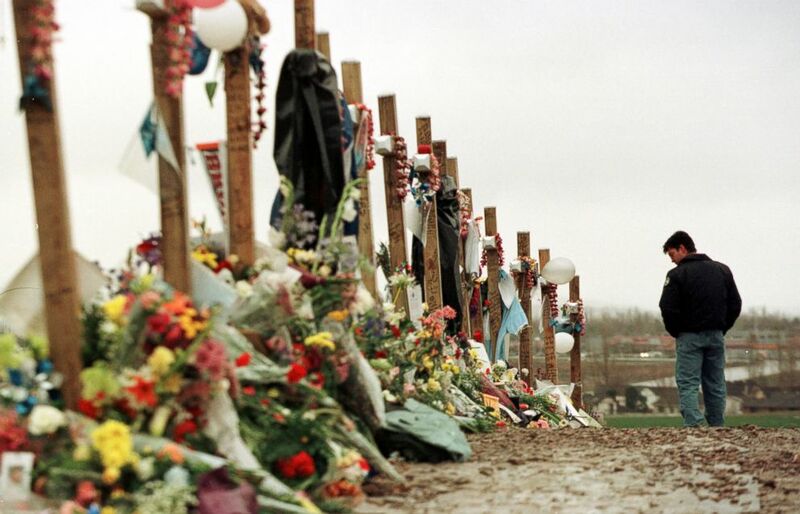 (Steve Peterson/Getty Images) Ryan Foreman of Denver's South Metro Fire Department, visits a memorial for the victims of Columbine High School tragedy in Clement Park, April 30, 1999. Foreman was among the first units on the scene of the April 20th shootings at Columbine High School in Littleton, Colo.
Just this year DeAngelis has been in touch with the leaders of high schools in Kentucky, Maryland and Florida, all where students were gunned down. With the principal of Florida's Marjory Stoneman Douglas High School, where killed 17 students and staff were killed in February, he said he's discussed what issues the school may face in the short term and long term. How do you handle returning to school for the first time? And prom? And graduation? How do you help the seniors getting ready to leave? What can you do for the new group of freshmen coming in next year? In the midst of their grief, the student survivors of the Stoneman Douglas massacre have banded together and inspired a new student-led push for gun reform, with nationwide events including school walkouts and the March for Our Lives rallies. 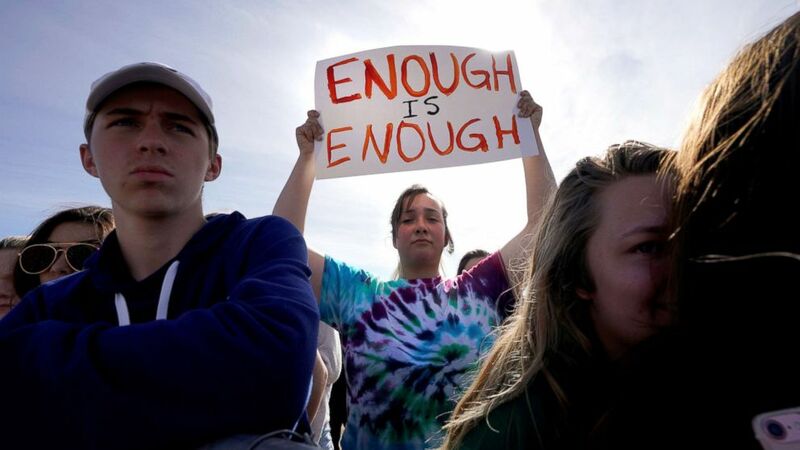 Current Columbine students, who weren't born at the time of the massacre, were among those participating in the nationwide walkout on March 14. (Rick Wilking/Reuters) Columbine High School student Leah Zunder holds a sign during a National School Walkout to honor the 17 students and staff members killed at Marjory Stoneman Douglas High School in Parkland, Fla., in Littleton, Colo., on March 14, 2018. (David Zalubowski/AP) Students carry a placards during a student walkout to protest gun violence on the soccer field behind Columbine High School on March 14, 2018, in Littleton, Colo. The next nationwide walkout is this Friday, on the Columbine anniversary. Organized by high school students in Connecticut, over 2,000 events are registered across the country. He said he wants tougher gun laws, but he stressed that other "pieces of the puzzle" must also be addressed, like mental health, the impact of social media and parent involvement. 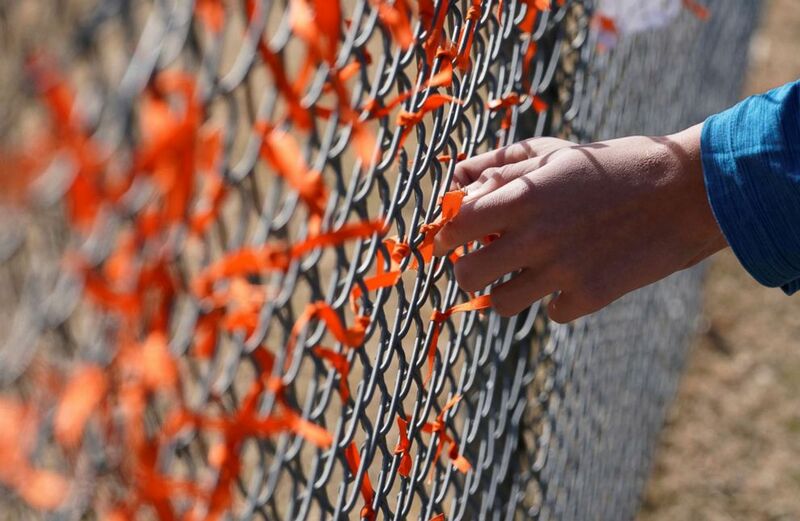 (Rick Wilking/Reuters) Columbine High School student Andrew Pavicich ties a memorial ribbon on the fence outside the school during a National School Walkout to honor the 17 students and staff members killed at Marjory Stoneman Douglas High School in Parkland, Fla., in Littleton, Colo., March 14, 2018. "The way that you change some of the laws, you need to change the officials," he said, encouraging young people to study policies and platforms and vote. "It could happen in any school in this state or any school in this nation," he said then. "No one is immune from a disaster like this happening. And I hope people will learn from it."